TV repairmen install and repair home entertainment systems for individuals in their homes. Education for this position requires learning from a trade school or vocational school. In some cases, you can receive your education from a community college. The majority of people who become TV repairmen usually go through an apprenticeship program which teaches them everything they need to know about the position. In this article, we are going to teach you what a day in the life of a TV repairman looks like. Find an online appliance repair course today. 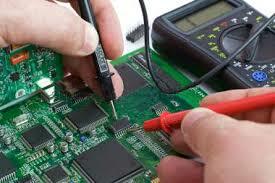 Becoming a TV repairman usually involves receiving some kind of certificate and in some cases, an associate's degree. Training courses are offered at most trade schools as well as vocational schools and community colleges. While this isn't necessary to become hired, it definitely makes your resume look more appealing to employers. If you would like to be considered for advancement opportunities, then you should pursue a bachelor's degree in electronics. This additional education makes you much more valuable to companies who are hiring. To enter into these programs, you must have a GED or high school diploma and you should also meet the other entry requirements associated with that school as well. Courses typically start you off by making you familiar with how a television operates. More advanced topics are covered later in the program. These may place more emphasis on certain techniques which are used to diagnose a television and troubleshoot any problems it may be experiencing. These are all vital techniques which you should become familiar with to successfully perform an installation or repair. The programs usually wind down by offering even more advanced theory on how to diagnose televisions and service them effectively. Your duties then would be to examine areas like voltage and circuit work and become familiar with all of the variables involved. Developing a strong sense of understanding is critical in order to become certified. To become a TV repairman, on-the-job training may also be required. This allows you to gain the experience you need to excel in this position. There are several paths you can take to make this happen. You can join an internship program which would allow you to work alongside someone who is already certified and experienced. They can then teach you and answer any questions you may have. An apprenticeship program is probably the most effective choice you can make in terms of training. There are plenty of programs out there and each one can make you shine in the eyes of an employer after you graduate. TV repair had actually gone down in demand for quite some time. After all, why pay to have a clunker fixed when you can purchase a brand-new television. However, times are changing. With televisions being manufactured in a more high-tech manner, they are becoming more valuable and people are more likely to call in and have them repaired. Especially with the huge advancement in technology, becoming TV repairmen is a job which will be both fun and rewarding.